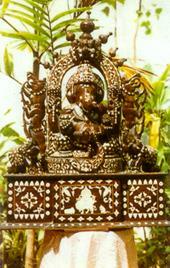 The prominent features in the idol of Ganesha is his Elephant head. Elephant is the biggest mammal of the land referred to in Hindu religious and other literature as gajam. Gajanana (elephant faced) is one of the names of Ganesha. Gaja is not a vedic word. In order to understand the esoteric significance of this word we have to study this word side by side with the vedic word Ajam or Aja. Ordinarily Aja means a goat but esoterically it means that which is not born indicating the infinite Brahman a negative name for a positive principle which is the repository of Nada Bindu and Kala. We have noted that Kala is the creative force and Bindu is an impulse from the creative force and Nada is the sound vibrations from which the phenomenal world appears. Nada is also called by the name of gao. The word Govinda is familiar to all Hindus as the name of God the creator of world. Govinda is made up of two concepts viz. 'Gao' meaning Nada and 'Bindu' meaning the impulse from Kala, the creative force. According to the Amara Kosa earth is also called by the name 'Gao' signifying that it is materialisation of sound (Nada) vibrations. Ordinarily gajam means an elephant. But esoterically it means earth which is born of gao. 'Gao' as already mentioned means Nada. 'Jam' means that which is born. 'Ajam' meaning that which is not born is infinite. It has no form. It is pure spirit. Whereas gajam symbolising the materialised world is finite. It has form and gajam the elephant is fitted in as an apt and meaningful symbol for this materialised world. This symbolic meaning is a latter day development and the elephant has thus secured a place of importance in the puranas of the Hindus. In puranic mythology abstract concepts are personified and woven into stories for the edification of common people and the symbols of elephants are very much significantly used for this purpose as the Carrytides of the earth by assigning them this grand role. Eight elephants known as Dikgajams are said to be carrying the earth on their backs, four of them occupying the four cardinal points and four others occupying the four intermediary points. The collapse of these carrytides mean the collapse of the world.